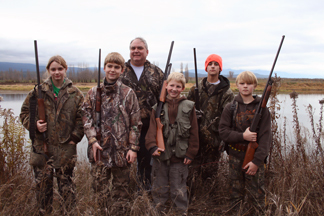 Bonners Ferry Youth hunt 2010! Bonners Ferry Goose Nesting Project 2009! About a dozen Bonners Ferry Chapter volunteers from Idaho For Wildlife work with members of the Idaho Fish and Game, on goose nesting projects designed to improve wildlife habitat at the Boundary Creek Management area. Idaho Department of Fish and Game provided the materials for putting up six boxes, which were filled with straw. “We felt like we really accomplished a lot and are looking forward to the fruits of our labor next spring when we have nests full of young goslings,” said Kevin Kimp, president for the local group. “We are conservationists also and we like to give back. We have a sense of obligation to give back to nature,” Kemp added. Volunteers were served lunch after completing their work.